Ever wondered how your smartphone magically stores your stuff? Well, inside it is a little piece of silicon – a NAND memory chip, where all the data is being safely kept. A new technology, however, is likely to emerge as an alternative to silicon-based memory chips. It is called phase-change memory (PCM), and the first mass-produced samples are already available from Micron. The chips that are currently in production are 1Gb (128 megabytes) in size, with an additional 512Mb (64 megabytes) of volatile memory included, which makes them suitable for use in feature phones. Future models, however, will be of greater capacity and might end up being used in smartphones and tablets. What makes the PCM chips better than conventional NAND flash memory is that they can theoretically reach read speeds of 400 megabytes per second. As the technology evolves, it might even replace the kinds of RAM modules that smartphone makers currently use. Last but not least, PCM memory is energy efficient, which should help prolong the battery life of devices it is used in. For more info about PCM and the way it works, check out the demo video that we have embedded below. BOISE, Idaho, July 17, 2012 (GLOBE NEWSWIRE) -- Micron Technology, Inc. (Nasdaq:MU), one of the world's leading providers of advanced semiconductor solutions, today announced an industry first with high-volume availability of its 45-nanometer (nm) Phase Change Memory (PCM) for mobile devices, featuring 1-gigabit (Gb) PCM plus 512-megabit (Mb) LPDDR2 in a multichip package. 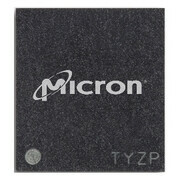 As the first company in the world currently offering PCM solutions in volume production, Micron is providing chipset vendors, enablers, and handset manufacturers with a proven product that meets the expanding needs of today's wireless market and paves the way for enhanced features and capabilities. I predict in the future that the PCM would be used on high to low and feature phones since is faster and more energy efficient than the current flash memory silicon chips. I'm a bit confused about "1Gb (128 megabytes)" and "512Mb (64 megabytes)". 1GB does not equal 128MB and 512MB does not equal 64MB. Some information MUST be missing. Capitalization is very important. "Gb" (lower-case b) = gigabit. "GB" (upper-case B) = gigabyte. 1 GB = 8 Gb. 1 GB = 1024 MB. 1 Gb = 1/8 GB = 1024 MB/8 = 128MB. I think it means the Transfer rate of 1GB is 128MB & 512mb is 64mb. @noim1: Did you read the article? "The chips that are currently in production are 1Gb (128 megabytes) in size, with an additional 512Mb (64 megabytes) of volatile memory included,..." These are clearly storage sizes, not transfer rates. This is a great advancement in mobile technology. Some time will pass before we see it put to practical use, however with current battery tech reaching it's limits, this is a logical step.